This is a project I started in NZ, and finished in Melbourne. When I moved here it was put in storage half finished… I had re-upholstered it, but the arms alluded me… I think it was fear of the unknown, and getting it wrong after spending so long on the upholstery. Threats from my mother to discard it in the next house-cull, led to renewed impetus to complete the project. Now that I’m older and uglier, I realise that fear just gets in your way of achieving things… so I had a great weekend sanding back the legs to their raw state, and rubbing amazing beeswax into them. (Can’t remember the name of the brand right now, but can look it up if you want to know)… gave the legs the most lustrous natural look. Not so sure about the ‘TV stripe’ fabric now… the 22 year old in me chose this one… guess its more interesting than the daggy floral that it once was. It’s very comfortable to sit in, has a great shape around the neck. Now it’s just a clothes horse like everything else. 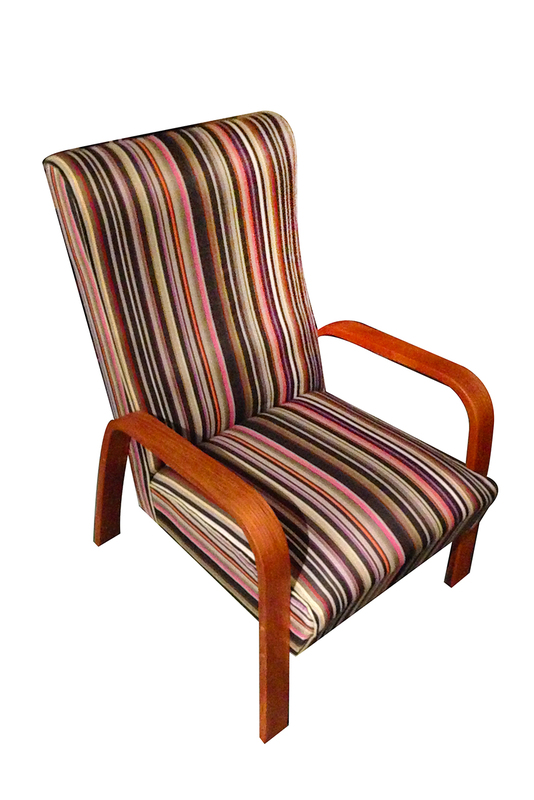 This entry was posted on June 17, 2013 by studiopossum in Craft and tagged chair, craft, modern, refurbish, teak, upholstery.